There lies within the Eastern section of the cemetery a link with one of Scotlandâ€™s most historic and well versed characters. The final resting place of John Begg nephew of our nationâ€™s famous bard Robert Burns. John was the son of Burnsâ€™s youngest sister Isabella. 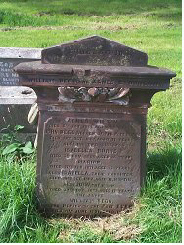 Her husband John Begg was a land steward on the Blackwood estate in Lanarkshire and died in 1813 after being thrown from a horse. Isabella later moved to East Lothian and finally settled and spent the rest of her life at Bridge House, Alloway. The grave of John Begg is another example of the many ways in which the Southern Necropolis can open our minds to wider and varied historical facts. His headstone like so many others serving as a carved index to a window on time. While looking into the family details of John Begg another interesting local connection with Burns came to my attention. Buried in the Old Gorbals Burial ground is a gentleman named John Wilson the inspiration for his poem â€œDeath and Dr Hornbrookâ€�. Wilson in his early years as a schoolmaster at Tarbolton parish took to dabbling in amateur medicine to the extent of having advertising printed promoting his free advice for common ailments. After attending a Masonic meeting where John Wilson displayed his so-called medical skills, Robert Burns set about writing the verses for â€œDeath and Dr Hornbrookâ€�.